It’s a bit ironic, but growth phases can carry a dangerous potential when it comes to the long-term health of a company. When everything is going very well in the moment, it’s not hard to find yourself trying to keep the present momentum going, even when you know there are areas that must be improved upon. Many organisations suffer an increase in inefficiencies during periods of high growth. They then struggle to recover when growth slows. It’s hard to get an accurate handle on the true state of your productivity and efficiency when you’re in a growth phase because the positives of getting more clients and achieving more business will often mask what’s really happening. 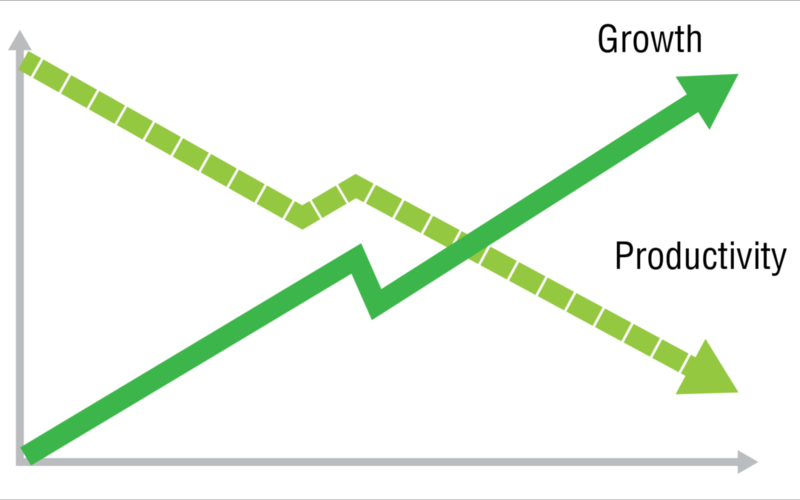 Growth phases are often the times when inefficiencies develop—usually undetected—and productivity drops. When the growth phase slows, you can be left in a precarious situation if you haven’t been paying attention to how things have been evolving. You’ve been busy working IN your business when you should have been working ON your business. There was a study done where somebody was given a full-time position, yet only given the workload of somebody with half the hours. It didn’t take long before half the workload took double the time to get done. It’s just human nature. We like to be seen working hard, and during a time of growth, the inefficiencies are hard to spot. But if you can spot and address them properly, imagine how much more you can get out of that growth phase. As a business owner, manager or other leader in an organisation, you know inefficiencies are there. In a strange way, you can feel it even if you can’t quantify it yet. How can you address this? The first step is understanding where you are in the life of your business. Odds are it was only you or maybe a partner or two who got things off the ground, be it two or 22 years ago, but the business has grown and as it expands and you take on new people, you naturally start to lose visibility in certain areas of the business. You’ve been doing this long enough to know that growth phases are part of a cycle. It doesn’t take a genius to make an organisation successful on paper when the money is flowing in, but when things start to level off, you’d better hope you’ve prepared yourself for the next phase. You can’t stay stagnant for very many years in the world we live in today. Even if you’re the same year-to-year, you’re still moving backward. The first thing you need to ask yourself is whether you’re working at building the business for the future, or if you are getting too caught up in today’s problems. Are you the one tackling day-to-day issues that really belong to higher-level managers? Do you have a system in place to continually review and ask questions about the business to ensure that inefficiencies are kept to a minimum? As a business changes, you need to change; as your strategy changes, you need to have the tools, technology, and people in place to maintain that strategy. If the business grows, the leadership structure has to change, and a culture will emerge. As the leader of the organisation, you need to understand that culture. Still, what if you can’t pinpoint the exact problems? If that’s the case, you need to commit to an intense review of the environment of your business, both internally and externally. You need to be able to recognise what you know and admit what you don’t know, as regards both the industry you’re in and the business you operate. It is only with such a review and these conclusions that you can determine a direction and begin to build a strategy for growth. David Nixon is Director, Advisor, Author, and Entrepreneur and is recognised as Australia’s Authority on Unleashing Growth Barriers for SMEs.